Well, the Intergovernmental Panel on Climate Change (IPCC) report on mitigation is out. I’ve got lots of reading to do. Joe Romm at Think Progress and Brigitte Knopf at Real Climate have done a better job of summarizing this than I. The shortest of the short summary is that the worst effects of climate change can be avoided at very minimal costs. 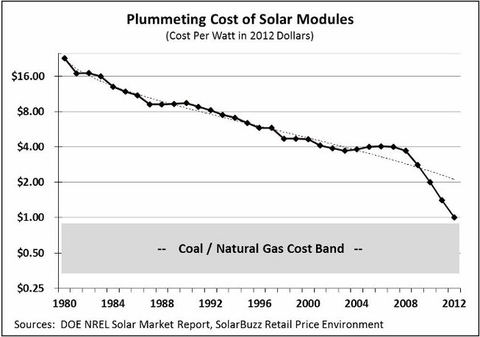 Paul Krugman has a related blog post about the falling cost of solar. Paul’s readership is probably orders of magnitude larger than any climate-change site, so it’s good to have the publicity. It’s also worth noting that onshore wind and hydroelectric power are already competitive with coal and natural gas. These are the pieces of information that make me hopeful for the future.